Various codes and regulations dictate the specification and construction of these tanks, helping to ensure optimum design and safe operation. This method uses a numerical solution to the McCabe-Thiele diagram to find the theoretical number of stages for binary and pseudo-binary systems,then calculates the actual number of stages, reflux ratio and column dimensions. Whether the plan is to shut down an entire plant, or just a portion of it, a definitive plan must be in place. Here is a step-by-step procedure to guide you through the process. These tips will help improve your e-mail style and make sure that your e-mail is effective intrinsically, as well as fitting the new electronic expectations of a wide range of cyber colleagues. 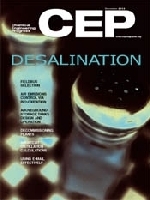 This article presents an in-depth analysis of thermal and membrane desalination economics and outlines a simple procedure for calculating the unit product cost for various desalination processes. Fieldbus technologies have become increasingly popular in process control applications. This article highlights the practical applications and economics of various buses, so that an engineer can choose the best one for his or her process. Relatively uncomplicated design and simple operation and maintenance requirements make biofiltration a good option for many types of air emissions control.